Features dozens of videos, high resolution animations, a cardiac output calculator, sections on assessment of ventricular function, pericardial fluid, fluid status, and much more. 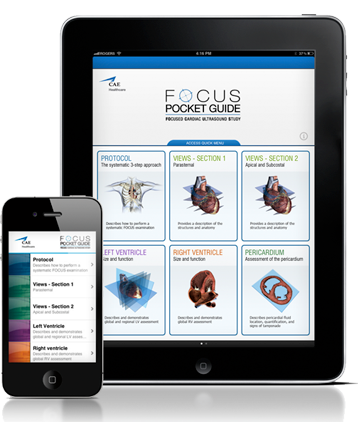 The FOCUS Pocket Guide App is an exciting new addition to the clinician ’s reference arsenal! 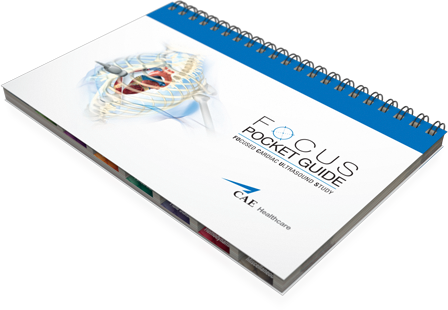 59-page fully color illustrated, highly graphical pocket guide depicting the FOCUS echocardiographic views and summarizing all the important key concepts of the FOcused Cardiac Ultrasound Study. Dozens of graphics, tables and pictures presented in a clear and concise manner. Easily fits in a lab coat pocket. An essential reference tool for any acute care specialist performing goal-directed bedside echo cardiography.